Since the mao cha for this tea dries at night beneath shade and moonlight, unlike the traditional sun-drying method during the day, the drying process is slower. 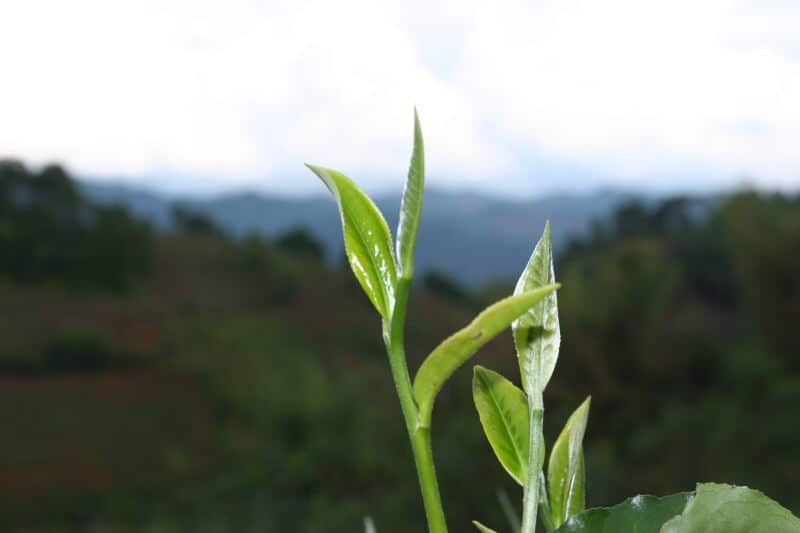 This necessitates careful attention from the tea producer to maintain air flow over the leaves to avoid molding. This process is well worth the effort, as it creates a unique and flavorful aroma similar to wulong. The tea color will be similar to olive oil, clean and crisp. To compress puer into cakes, the tea is weighed with a scale traditional weight was 357 grams, but now many factories use 400 grams as a standard. A piece of cotton fabric that will hold the tea leaves is placed inside a special 1 foot deep tin bucket that has holes on the bottom. Then the bucket it is filled nearly to the top with dried tea leaves. They place a one inch square of paper that is stamped with the company’s logo on top of the cake, with a few leaves covering the sign. The stamp will become slightly embedded in the cake, a sign of authenticity showing that the tea has not been separated from its original label. One person sits in front of a steamer, steaming the leaves for 3-5 seconds and then removing the fabric and wet leaves from the bucket. 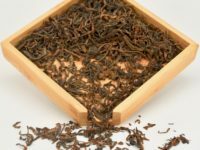 The dry tea leaves are condensed from being very light and puffy down to a layer only 3 inches thick. The next person will quickly tie the fabric, making a knot at the end. They then compress the knot into the center of the cake under a compression machine. It takes a perfectly precise amount of pressure to compact the wet tea leaves tightly into a one inch thick cake. This process leaves the tell-tale indentation mark on the back of puer cakes. Some producers still use the traditional method of compressing cakes, which requires two stone molds curved to match the shape of puer cakes. Someone stands on top of the filled mold and applies their body weight evenly to press the cake into shape. Factories that use this method will have one worker whose job it is to compress these cakes so that they are all compressed the same amount. They must be a specific weight so as to not over-compress the cakes. The small amount of space between the leaves after compression will allow air to move through and naturally ferment the cake over years. After a few hours, the wet cakes are removed from the fabric and placed on wooden shelves to slowly dry for a few hours at a temperature of about 40 degrees celsius. Once the tea is dry, the cakes are sent to a skilled tea worker who uses cotton paper to quickly wrap the cakes. They will fold the squares of cotton paper so there are exactly sixteen folds. Stacks of 7 cakes are packed in clean, dry bamboo shells. These shells are tied together with bamboo string to secure them for transportation. This traditional packing method is still often used. The bamboo shell will protect the tea from rain while still allowing the tea to breathe. Bamboo is a very neutral scent, and will insulate the tea from picking up other scents. Old government building in Puer City, where puer tea trading happened for centuries, hence the name "Puer"
Puer tea producer's storage for good old puer cakes. Taking a break from production to drink tea and play mahjong. The traditional way to store puer cakes is wrapped in bamboo packages. Learn more about Puer Tea.